Recent review: Michael, did an excellent job at my retirement ceremony. I will recommend him for any events. 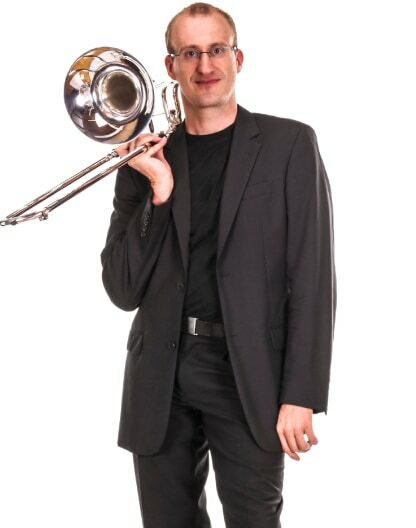 I'm a trombonist and tubist. I'm also learning to play guitar and has a little experience playing cornet. Wanting 76 trombones at your next party!?! Whoa... that might be a bit of brassy overkill. But one or two of ‘em might be just the ticket! You know that you love how it looks like a long, gold slidin’ thing and that it makes an awesomely low sound... so you know that you’ve gotta have a trombone player at your next event or in your band’s next concert! Whether you’re looking for a solo trombonist or brass ensemble for your event or if you need a talented trombone player to join your ska band... look no further than right here on GigSalad. We got ‘em, and boy are they ready to play for you! Today, the trombone can usually be found in ensembles, concert bands, symphony orchestras, marching bands, military bands, and brass bands. It can be part of smaller groups as well, such as brass quintets, quartets, trios, and even solo. Trombones are also common in swing, jazz, salsa, rock, R&B, and ska music... though it's most popular in jazz and swing music. There's only a few small steps that you must take in order to hire one of these talented trombone musicians for your upcoming event. Just take a few minutes to watch videos, listen to audio, check out photo galleries, read reviews, and get in contact with different trombone players for hire... all right here on GigSalad! Trust us, it really is that easy for you to book the best entertainment possible.